Lot Detail - Taxation No Tyranny Joseph Reads Signed Copy! 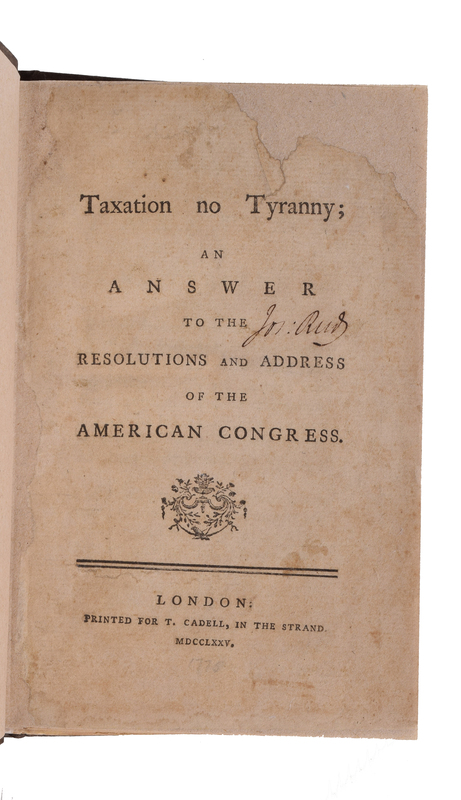 Taxation No Tyranny Joseph Reads Signed Copy! A president of the Continental Congress and signer of the Articles of Confederation (1741–1785) who also served as Washington’s aide-de-camp during the Revolutionary War own copy.London, 1775.,91pp. Fair condition professionally restored areas of the the half title and top corners areas of the first 10 pages and with the last 3 pages in facsimile. From the library of Joseph Reed Joseph Reed (August 27, 1741 – March 5, 1785) was a lawyer, military officer and statesman of the Revolutionary Era who lived the majority of his life in Pennsylvania. He served as a delegate to the Continental Congress and, while in Congress, signed the Articles of Confederation. He served as President of Pennsylvania's Supreme Executive Council, a position analogous to the modern office of Governor. Rare edition of this famous political pamphlet by lexicographer Samuel Johnson.Written in response to the opening rumblings of the American Revolution, Johnson's acerbic pamphlet was published at the height of his popularity and fame. He writes of the Americans: "That it is their duty to pay the cost of their own safety they seem to admit; nor do they refuse their contribution to the exigencies, whatever they may be, of the British empire; but they make this participation of the public burden a duty of very uncertain extent, and imperfect obligation, a duty temporary, occasional and elective, of which they reserve to themselves the right of settling the degree, the time, and the duration, of judging when it may be required, and when it has been performed." This pamphlet elicited many responses, and doubtless further spurred the cause of the Revolution. ESTC T141339. SABIN 36303. AMERICAN CONTROVERSY 75-69b. COURTNEY & SMITH, p.125. REESE, REVOLUTIONARY HUNDRED 26.